There has been quite a bit publicized on saving energy with AC Drives. This article will serve to set the facts straight and provide practical real-world application estimates on what a user can realistically expect to get in return for their AC drive investment. The main applications always cited for ROI (return-on–investment) for AC drives are centrifugal pumps and fans and for good reason. Both centrifugal pumps and fans obey what is called the affinity law. The affinity law states that speed reduction results in linear flow reduction, with torque dropping off as a square of the speed reduced, and horsepower (Kilowatts) dropping off as a cube of the speed (Refer to Figure 1). 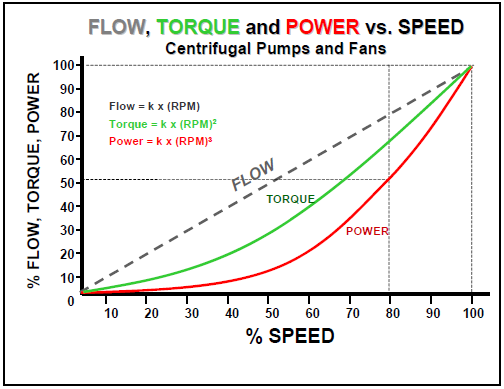 In theory, this means by slowing a pump or fan to 80% flow would result in nearly a 50% decrease in power consumption. Taking it further, reducing speed and flow to 50% results in only 12.5% of the full speed power consumed. When compared to conventional flow reduction techniques – valves for pumps, dampers or guide vanes on fans, which serve to restrict flow, the area for savings becomes apparent. The AC drives that manufacturers target for the centrifugal pump and fan market are known as Variable Torque Drives. Design-wise, the power electronics are no different than Constant Torque Drives, other than overload ratings – typically at levels of 110% for one minute, vs. 150% on Constant Torque Drives. It’s valid for the manufacturers to re-rate like this, since load drops off rapidly as speed is reduced, providing plenty of additional overload “headroom” at the new speed. When we consider that 60% of industrial and commercial electrical consumption goes for pumps and fans, it’s easy to see why drive manufacturers promote this area so heavily. However, the affinity curve is “theoretical” – it does not take in to account the power needed for static head pressure and “lift” (pressure created by height differential), which offsets the curve. Dynamic head pressure changes with speed, and is equivalent to frictional load losses. This means that reducing speed to reduce flow will still save energy, but not as much as the theoretical curve suggests (Refer to Figure 2). Static and dynamic back pressure caused by narrow duct runs, high loss elbows, bends and fittings are losses that have to be overcome before flow control savings are realized. In addition, operating factors weigh heavily into power savings estimations. If a pump or fan is operating to capacity, where the installation of a drive would mean that the AC drive would always be running at 100% speed (60Hz), there will be no power saved. By introducing an AC drive, you’re banking on the fact that the motor has not been designed in to full capacity – and that flow control can be implemented and exercised in the drive. Most users want to see a payback on their AC drive investment (drive cost + installation cost) in less than 2 years for project justification. Several assumptions will be made here. First, the life cycle of the AC drive is 10 years (a conservative estimate by today’s reliability standards). Second, the total installation and maintenance costs are equal to 20% of the drive’s initial purchase price over this life cycle. Even with the most conservative estimates, energy savings alone can provide payback in a period much less than the 2-year benchmark. It is reasonable to assume a conservative 20% energy savings when using an AC drive on a pump or fan application, in place of conventional flow controls. More variables will not necessarily yield greater accuracy in estimating savings. Another area where utilities may gouge customers is with peak demand charges, a surcharge based on the highest peak power measured within a predetermined time frame. Inrush currents when starting motors across the line (no drive) are typically 6 to 7 times the motor’s full load amperage rating, and remain high until the motor has reached speed. With small motors, it is doubtful inrush current will reach levels high enough for these charges to kick in. However, on larger motors that are line-started, the likelihood of hitting peak demand levels is much greater, as not only are currents are higher, but also the time needed to attain speed is longer. When an AC drive is used, not only is current limited, but full load torque -with overload- is available throughout the speed range, for difficult to accelerate loads. Acceleration and deceleration ramp rates can be linearly controlled, and s-curve ramps are available, eliminating jerk that can occur as the ramps begin and end. This results in increased belt life, eliminates water hammer on pumps, and reduces overall wear to all mechanical components. Yet another area that utilities will penalize customers is poor power factor. AC induction motors running across the line have a lagging power factor (current lagging voltage). Power factor on AC motors typically range from 0.75 to 0.90. Poor power factor makes it necessary to oversize distribution system elements, to handle the extra reactive currents that do no useful work. Industrial plants deal with power factor by installing large banks of power factor correction capacitors upstream of the contributing equipment, that are switched in and out as needed to compensate for the variation in lag. AC drives inherently correct power factor. Although the drive output to the motor may be operating at a power factor of 0.80 at a given point of time, input PF to the drive is maintained near unity (actually 0.96). Input current remains in phase with voltage, as the diodes conduct only at the peak, or center, of the sine wave. Reactive currents that flow between the motor and the drive are never seen on the drive’s input. Power factor correction capacitor banks and their associated switchgear are not needed when using AC drives –a major expense savings. Beyond this inherent PF correcting capability, the AC Drive has the intelligence to cut losses even further. It can sense when the motor is lightly loaded, and automatically reduce voltage to improve power factor in the motor. This reduces losses created by reactive circulating currents between the drive and motor. Even when running full speed, if the motor was “oversized”, the resulting current reduction means less losses in motor cabling, motor rotor and stater resistive losses. In Conclusion, when a user asks “How can I justifiably afford to buy a drive?” to put on a centrifugal pump or fan application, in almost every case the answer should be, “You can’t afford not to!” with plenty of supporting proof. With demonstrable paybacks in 2 years or less, every dollar saved beyond that point is money in the bank. The larger the drive, the bigger the returns- a 1500 HP drive can save millions over its life cycle. Dave Gazda is an Application Engineer for Advanced Controls and Distribution.